Mention of Highly Enriched Uranium (HEU) conjures up vision of a nuclear weapon. Uranium is called as HEU if the enrichment level is higher than 20% and Low Enriched Uranium (LEU) if it is lower. 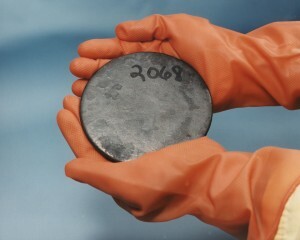 Natural uranium has an enrichment level of 0.7%.At the borderline enrichment level of 20%, it takes over a tonne of HEU to make a bomb, but at 90% it requires less than twenty kg. 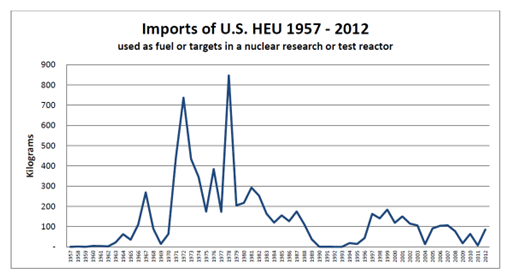 Appreciable amounts of HEU have been used in many countries for civilian applications, mainly to fuel research and test reactors. 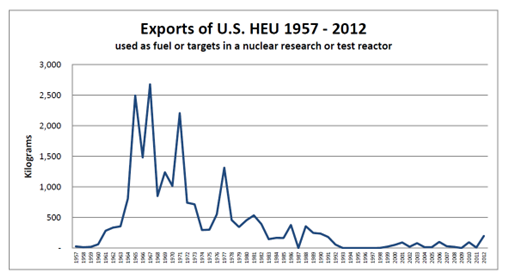 Nuclear Weapon States (NWS) helped set up the reactors in other countries and also supplied the HEU fuel. In recent years, with international assistance, many of these reactors have been redesigned to run on LEU fuel. Some of the HEU earlier supplied to countries is still present in a few of them. There is preference in some cases to continue to use HEU in the reactors for reasons of compactness and to obtain higher intensity of neutrons for experimental purposes. The most recent compilation of data on worldwide civil HEU stocks can be found in the report published in October by David Albright and Serena Kelleher-Vergantini of the Institute for Science and International Security (ISIS), USA titled Tracking Inventories of Civil Highly Enriched Uranium. Their task was not easy since official information on transfer of HEU to countries and its return is scarce. They have had to rely on open information for the most part. The ISIS report says 136.8 Te of the material (upper estimate) is believed to be held by various countries in the world. The enrichment levels vary in these stocks and details are not available. A country is said to be free of HEU if it is holding less than one kilogram of it after either returning most of the material to the Supplier State or blending it with natural uranium to lower the enrichment. The Report lists altogether 27 countries in this category. Some years ago as many as sixty countries were found to be holding more than one kilogram each. Now the number is down to twenty-six countries due to efforts made by the supplier countries to get the material returned. Non-Nuclear Weapon States (NNWS) together hold 16.8 Te (upper estimate) of which Kazakhstan has 10 Te. The combined stock of eleven other NNWS amounts to 6.7 Te (upper estimate). The balance is distributed among the rest fourteen States. It comes as no surprise that among the five NWS, US alone holds 93 Te, followed by Russia with an estimated 20 Te. France comes next with 4.65 Te. England has 1.4 Te and China has one tonne. The weapon-related HEU stock is not included in these. There is a long history of HEU transfer between countries mainly for use as fuel in reactors meant for research, testing, isotope production and power generation. The US and Russia have been the major suppliers of HEU to other nations. As minor suppliers, UK, France and China have provided kilogram quantities of HEU to a few countries. US had provided about 6 Te to sixteen NNWS of which Canada, Germany and Japan received in excess of one tonne each. Belgium, Netherlands and South Africa received in excess of half a tonne. Soviet Union made available a little over 10 Te to seven countries including China. Kazakhstan alone received 10 Te from Russia for use in a power reactor. China in turn has provided 1 kg weapon grade HEU to each of five countries for setting up neutron source reactors. A report from US Department of Energy tells us more on US HEU supplies. Between 1957 and 1994, under the Peaceful Uses of Atomic Energy programme, the US had supplied about 25.6 Te of HEU to 31 countries. The enrichment level varied from 20% to a little above 90%. France received about 7.7 Te. Germany was provided 11.3 Te while Canada and Japan each got about 2 Te. Russia is the other major supplier of HEU fuel for research reactors and there is little information on its transactions. But, it is known that Russia provided uranium fuel in three enrichment levels (17, 21 and 26%) for the fast breeder reactor BN-350 in Kazakhstan that began operation in 1972. The reactor was permanently shut down after 27 years of operation. According to one estimate, the fully loaded core had 6.4 Te HEU and during its operating life the reactor used about 32 Te of 17% LEU, 17 Te of21 % HEU and 50 Te of 26 % HEU (Pavel Podvig: History of Highly Enriched Uranium Production in Russia, Science & Global Security, 19:1, Note No. 10 and 11, pg. 61, 62). Most of the spent fuel from the reactor was sent back to Russia for reprocessing. When the reactor was permanently shut down, about 10 Te of the highly radioactive spent fuel remained and has been consigned to storage at a safe site in Kazakhstan with US assistance. Russia is reported to have provided no higher than 80% HEU to other countries. After the International Programme for Reduced Enrichment for Research and Test Reactors (RERTR) was introduced in 1978, Russia began limiting HEU supply to enrichment levels no higher than 36%. More recently, Russia provided 240 kg of 64.4% HEU for the Chinese Experimental Fast Reactor (CEFR) according to the ISIS report. The reactor was commissioned in 2010. The IAEA is also a good source of information on HEU used in research and reactors. It has published data on the range of enrichment levels used (Figure 1) and on the number of fuel assemblies stored in various countries with information on the provenance of the HEU in these (Table 1). 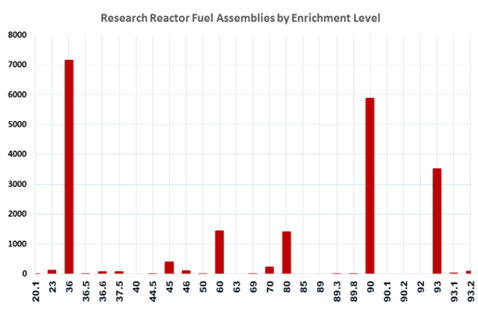 Although the enrichment levels vary with the reactor, each fuel assembly could have a few hundred grams of HEU. The core of a reactor could hold a few kilograms. The total in storage works out to about 5 Te. The radioactivity content of these used HEU fuel assemblies drops to low enough levels after a few months to allow easier handling. The enrichment level in spent fuel gets reduced as uranium is used up in the reactor. Large numbers of used Fuel Assemblies would be required to recover and purify enough HEU for one device. In recent times, citing security concerns, supplier countries are making efforts to recover the HEU they had provided earlier. A total of 7.7 Te had been returned to US by 1994. About 60% of the US origin HEU still remaining abroad is highly radioactive having been used in a reactor. The unused stuff is in the form of metal, compounds, scrap, and waste and as such is less secure. About 6.7 Te of US HEU remaining in other countries has been either converted to LEU by mixing with natural uranium or consumed by fission in the reactors. The Authors of the ISIS report have made an egregious error in including India in the list of recipients of 5 kg of Russian origin HEU. They correctly point out that India received 5 kg of HEU as fuel for the Apsara research reactor, twice from UK and once from France. While the used HEU fuel was returned to UK, the French supplied stock is presently being kept in monitored storage under safeguards. The reactor is being redesigned to function with LEU. The ISIS report also refers to discussions India had with France in 1970s for supply of HEU for the Fast Breeder Test Reactor built with French assistance. However, it disregards the subsequent fact –acclaimed by India in various fora – that the reactor was actually commissioned and is being run with indigenously produced plutonium-based fuel for the reactor. The explicit statement in the report that “there remains some uncertainty whether France supplied this HEU, which would have amounted to tens of kilograms of HEU” can only be considered mischievous.